For some, this past week’s Polar Vortex was just a freak weather incident. But for Leann Abad and his co-founder Tyree Gorges, it was a call to action to help those experiencing homelessness. Temperatures took a nosedive to far, far below zero, with temperatures that rivaled the coldest days of Antarctica. There were nearly a dozen deaths related to the extreme weather, and those experiencing homelessness were impacted the most in truly dangerous and life-threatening temperatures, with homeless shelters over capacity. Moments like these are when the world’s best entrepreneurs recognize the potential for a product that can help. Aside from the undeniable fact that ‘Polar Vortex’ is just a great brand name, Leann and Tyree applied their lightbulb of creativity to a real social issue. In my interview with Leann, he shares the story from coming up with the idea a mere two weeks ago to now, with a line of clothing already out. Half of the proceeds will go to homeless shelters and volunteers. Leann lives in Detroit, so he was abreast to all of the information about the Polar Vortex via the news and social media, experiencing the frigid temperatures himself. The idea struck: He would make a fashion line around the Polar Vortex, referring to the freak weather as a ‘concert tour’ that hit the Midwest exclusively. He knew time was of the essence, and he had to get started immediately: the weather wouldn’t last forever (thank goodness! ), and the name ‘polar vortex’ would soon be forgotten as a result. His friend, Tyree Georges, happened to be an amazing designer, and they got to work immediately on putting the clothing designs together. But it’s so much more than just a cool name. Half the proceeds from all clothing sales will be donated to homeless shelters. Leann shared that during the peak of the vortex, Detroit reached a record low temperature of -14 degrees Fahrenheit, breaking a 99-year record (which had been -7 degrees, if you were wondering). It wasn’t just Detroit. Chicago’s temperature took a nosedive to temperatures as low as -23 degrees. In response to the subzero temperatures, a conversation was beginning on social media and in articles online regarding the homeless. The question became: How do we help? Homeless shelters were reaching capacity and many shelters were concerned that they would have to turn away those experiencing homelessness if there was no room left. “I’m very privileged to have a warm place to go at night,” Leann reflected with gratitude. We all are. It’s become his mission to make sure homeless shelters will always have the resources they need to be prepared in these worst case scenarios, and no one will be left outside in temperatures that are impossible to withstand. 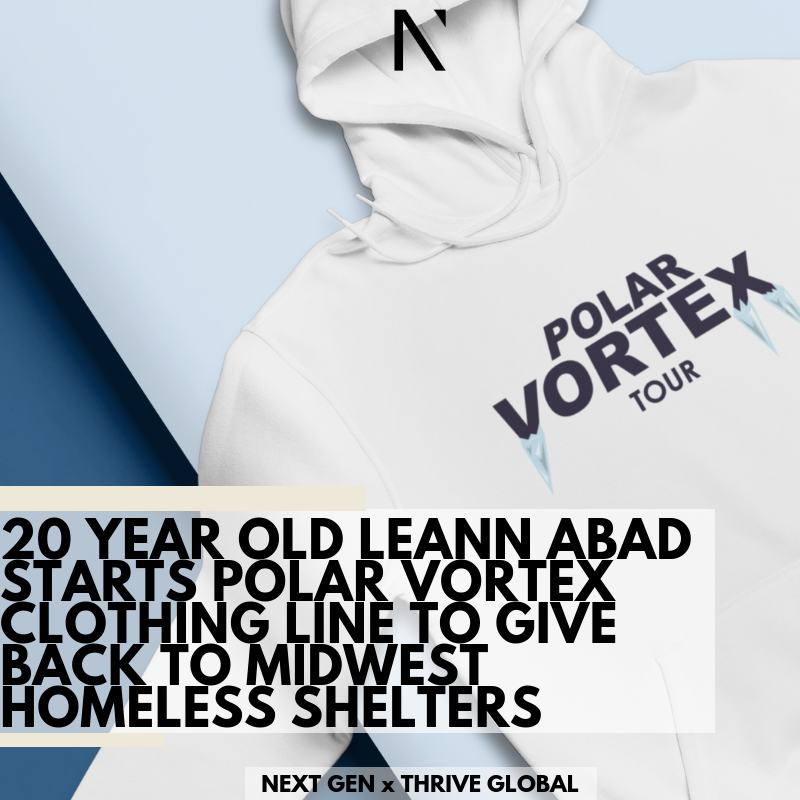 Leann is aiming to donate up to $20,000 to homeless shelters in the midwest from the Polar Vortex line. It is his commitment to social impact, entrepreneurial eye, and passion for people that will assuredly make Polar Vortex a line to watch. Polar Vortex is open for pre-orders for the official premiere collection (I’ll be getting mine this week! ), and they plan to start production mid-February. By the end of this month, we’ll all be wearing our new fab Polar Vortex clothing – and feeling warm inside knowing our money went to a truly incredible cause. To connect with other young changemakers who bring ideas to life, join the Next Gen Community. Regardless of if this idea defines the rest of Leann and Tyree’s entrepreneurial lives or stands as this one project, it’s making an impact. It inspires all of us to ask, “how can we align our businesses with social impact?” That’s the true meaning of momentum: rising to the urge of an idea that can change communities, and taking action immediately on our visions. We’re excited to see what they do next.